LANSING, Mich. (AP) — In an audacious flex of political muscle, Republicans in a single day reached the brink of a goal that for years has seemed an all-but-impossible dream: making the labor bastion of Michigan a right-to-work state. The GOP majority used its superior numbers and backing from Gov. 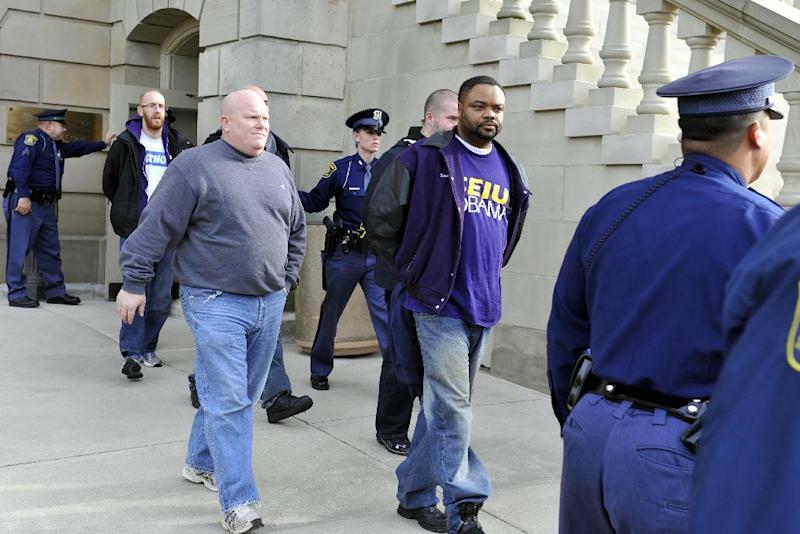 Rick Snyder to ramrod legislation through the House and Senate on Thursday, brushing aside denunciations and walkouts by helpless Democrats and cries of outrage from union activists who swarmed the state Capitol hallways and grounds. At one point, police used pepper spray to subdue demonstrators who tried to rush the Senate chamber. "Shame! Shame on you!" protesters chorused from the gallery as the Senate voted. Earlier, security guards removed a man who yelled, "Heil Hitler! Heil Hitler! That's what you people are." Another shouted, "We will remember in November." 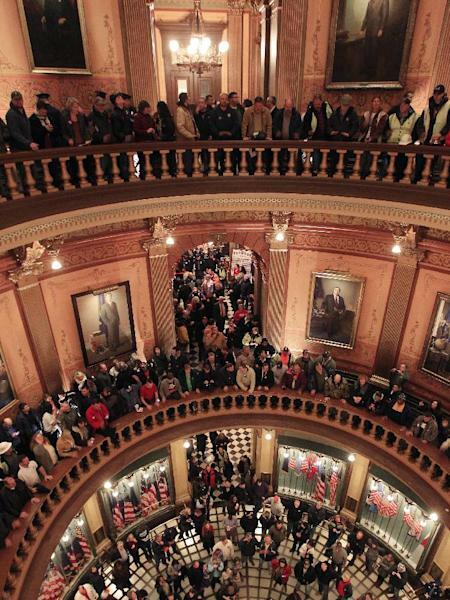 Michigan could become the 24th state with a right-to-work law next week. Rules require a five-day wait before the House and Senate vote on each other's bills; lawmakers are scheduled to reconvene Tuesday and Snyder has pledged to sign the bills into law. A victory in Michigan, a cradle of organized labor, would give the right-to-work movement its strongest foothold yet in the Rust Belt, where the 2010 election and tea party movement produced assertive Republican majorities that have dealt unions one body blow after another. 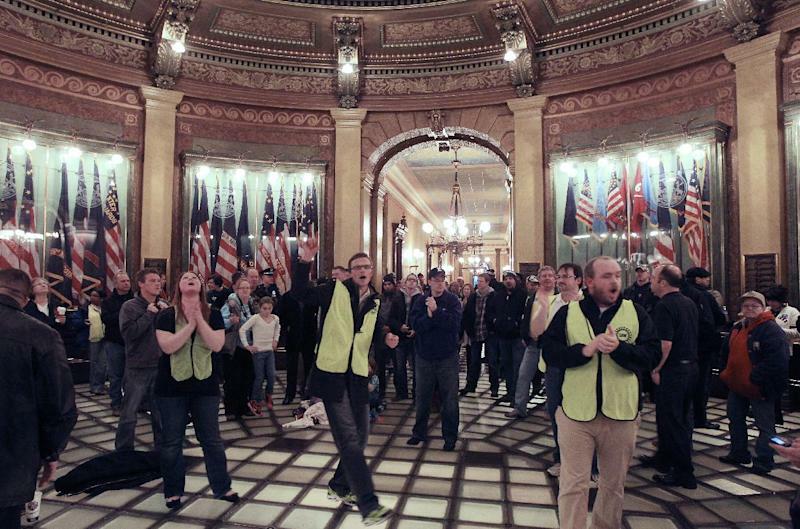 But compared with Indiana and Wisconsin, where votes to curb union rights followed weeks or months of pitched battles, Michigan acted in the blink of an eye. GOP legislative leaders were saying as late as Wednesday that it was uncertain whether the issue would come up in a lame-duck session moving toward adjournment. Snyder had said repeatedly since his election two years ago that the topic was divisive and not on his agenda. Thursday morning, however, the governor called a news conference with House Speaker Jase Bolger and Senate Majority Leader Randy Richardville to announce that not only would right-to-work legislation be considered, it would be placed on a fast track. By sundown, bills had been introduced and passed without committee votes or public hearings. Republicans insisted the measures had been given adequate consideration, saying the topic was familiar — particularly after the protracted campaign that preceded voters' overwhelming November rejection of a proposed constitutional amendment that would have barred right-to-work laws. "We've come to the point where this issue is on the table," Snyder told The Associated Press in an interview. "It's time to step up and make a decision and not let this fester." He and legislative leaders denied opponents' contentions that the bills were designed to weaken unions by depriving them of funds needed to bargain effectively or were retaliation for the ballot initiative, which organized labor spearheaded. They said a "freedom to work" law would make unions more responsive to members' needs and give employees freedom to decide whether to accept union representation. "This does not change collective bargaining and this is not anti-union," Bolger said. "It is pro-worker." Senate Majority Floor Leader Arlan Meekhof said a number of factors influenced the decision to push ahead, including Snyder's endorsement and the ballot initiative, which put right-to-work in the spotlight. Primarily, however, Republicans recognized they had enough votes to capture a long-sought prize, he said. "I wouldn't say there was a sense of urgency, but a sense of opportunity," Meekhof said. Democrats contended Republicans, who lost five House seats in the November election, wanted to act before a new legislature takes office next month. In passionate floor speeches, they accused the majority of ignoring the message from voters and bowing to right-wing interest groups. "These guys have lied to us all along the way," Senate Democratic leader Gretchen Whitmer said. "They are pushing through the most divisive legislation they could come up with in the dark of night, at the end of a lame-duck session and then they're going to hightail it out of town. It's cowardly." Eight protesters were arrested for resisting and obstructing, state police Inspector Gene Adamczyk said. At one point, officers barred entry to the Capitol as a safety measure, saying the building was overcrowded. It was reopened after unions successfully petitioned Ingham County Circuit Judge Joyce Draganchuk for an order overturning the move. In the end, the bills sailed through — even though some Republicans were opposed. The Senate approved a measure dealing with private-sector workers 22-16. As Democrats stormed out of the chamber, a second bill applying to government employees was passed, 22-4. The House approved a private-sector employee bill 58-52. Both chambers are expected to approve two identical measures next week. Leaders said they would include exemptions for police and firefighters, who are covered by existing law requiring binding arbitration for their labor disputes. A $1 million appropriation was tacked onto the bills for what a House spokesman described as implementation and worker education activities. Spending bills are legally protected from being overturned by statewide referendums. United Auto Workers President Bob King, who joined the protesting crowd, said the bills' passage was "a very partisan, polarizing attack." A White House spokesman said President Barack Obama continues to oppose right-to-work laws. "Michigan — and its workers' role in the revival of the U.S. automobile industry — is a prime example of how unions have helped build a strong middle class and a strong American economy," the spokesman said.